We’d love your help. Let us know what’s wrong with this preview of Lilac Lane by Sherryl Woods. At the heart of Lilac Lane is Keira Malone, who raised her three children alone after her first marriage broke apart, and who, after years of No one writes about friends, family and home better than Sherryl Woods. Told with warmth and humor, Lilac Lane is a brand-new story in her beloved Chesapeake Shores series, one readers all over the world have waited two years to read! To ask other readers questions about Lilac Lane, please sign up. Kiera Malone is mourning the unexpected death of her fiance. She has been living apart from her family in Ireland and needs to reassess her future plans. Her daughter, Moira, is concerned about her emotional stability and invites her to stay with her in Maryland. Kiera makes the journey and finds employment at an Irish pub owned by her family. Life starts to improve but she finds herself at odds with the chef who is named Bryon. After a few weeks she starts to feel more secure and rents her own a Kiera Malone is mourning the unexpected death of her fiance. She has been living apart from her family in Ireland and needs to reassess her future plans. Her daughter, Moira, is concerned about her emotional stability and invites her to stay with her in Maryland. Kiera makes the journey and finds employment at an Irish pub owned by her family. Life starts to improve but she finds herself at odds with the chef who is named Bryon. After a few weeks she starts to feel more secure and rents her own apartment. Her bad luck continues when she discovers that the obnoxious chef is her neighbor. Bryan and Kiera work through their differences and begin to forge a friendship. This unlikely pair learn to trust each other and together they tackle each other's demons. Book 14 in a popular series, but my first encounter reading a Sherryl Woods story. I wouldn't mind looking out for a few more in the series because I quickly fell in love with many of the characters. Good mother- daughter/husband-wife/father -daughter- contemporary family saga. Sherryl Woods returns with her popular Chesapeake Shores series following (2015) Willow Brook Road Chesapeake Shores, #13 with LILAC LANE (#14) —From Ireland to Chesapeake Shores – A magical place for healing and a little romance. This time around we catchup with Moira and Luke O’Brien and their baby girl, Kate. Of course, with Nell and many of the familiar characters and places we love. Moira is concerned about her mom, Kiera. Her husband Peter’s unexpected death was shocking after her second Sherryl Woods returns with her popular Chesapeake Shores series following (2015) Willow Brook Road Chesapeake Shores, #13 with LILAC LANE (#14) —From Ireland to Chesapeake Shores – A magical place for healing and a little romance. Moira is concerned about her mom, Kiera. Her husband Peter’s unexpected death was shocking after her second chance and raising her children on her own. Moria wants her to come and live in Chesapeake. A steady dose of the O’Briens will restore her spirits. She had wasted years of bitterness and regrets after Moira’s dad left. She had taken a chance on love and now he was gone. Maybe she could tell her she needs help with the baby, but possibly she can get her a job at the Irish pub, keeping an eye on the chef and making sure he does not stray too far from the proper Irish recipes. Her mom needed the family. With much persuasion, she agrees to come to charming Chesapeake Shores as a consultant. She can always return to Dublin. She rents a lovely cottage on Lilac Lane and is feeling good being part of a family. However, soon learns her neighbor is none other than Bryan Laramie, the not so pleasant and annoying chef at the pub, with whom Kiera is constantly at war with. Moira soon sees the electricity between her mom and Bryan (similar to the relationship between her own relationship with Luke), when they first met. However, Kiera thinks he is infuriating. Of course, if you know the O’Briens they never mind their own business and the clan is always meddling to make sure everyone is happy. Bryan on the other hand has his own past. He had enough broken hearts to last a lifetime and was still recovering from this last one. Then his long-lost daughter shows up and both Bryan and Keira may have more in common than they may know. Plus, as always, there is always a community-wide event to ignite the flames. With some competition, stubbornness, clever planning, Irish recipes, sacrifices, meddling, bets, some risks, and of course a little romance, to demonstrate love conquers all. If you enjoy heartwarming stories of strong family bonds and authentic characters, Chesapeake Shores will draw you into their world with open arms. For fans of Debbie Macomber, Joanne Demaio, Mariah Stewart, and Susan Wiggs. LOVE the Chesapeake Shores series (TV series and have read all the books in the series)— among many of her other books. A longtime fan of Sherryl Woods, starting in my younger years (before Goodreads) thru today. I love the idyllic settings, vivid descriptions, and intriguing characters. Looking forward to hopefully Season 3 since Season 2 just wrapped up. Always look forward to the Sunday show. It makes me want to return to these books and read them for the second time. Sherryl allows you to escape and travel without leaving your home. It is the next best thing to being there. An ah moment. Many thanks to MIRA and NetGalley for an advanced reading copy. I also listened to the audiobook, narrated by Christina Traister for an engaging listening experience. In addition, I am very excited about the highly anticipated A Small Town Love Story: Colonial Beach, Virginia Coming Nov 14, 2017 on my Top 20 Books coming Nov. Part memoir, part oral history. The author gives us a rare and intimate look at Colonial Beach, Virginia. Readers you will want to add this to your library collection and your must-read list. Right before I started reading this I realized that it’s the fourteenth book in a series so to say I was little apprehensive is fitting. That is a LONG history and I feared I would have trouble connecting with the characters or that I would be lost due to long running backstories. Thankfully, I had absolutely no issues at all and found myself immediately swept away to Chesapeake Shores and totally charmed by this quaint little town and it’s residents. It looks like every book in this series follo Right before I started reading this I realized that it’s the fourteenth book in a series so to say I was little apprehensive is fitting. That is a LONG history and I feared I would have trouble connecting with the characters or that I would be lost due to long running backstories. Thankfully, I had absolutely no issues at all and found myself immediately swept away to Chesapeake Shores and totally charmed by this quaint little town and it’s residents. It looks like every book in this series follows a new couple, reminiscent of RaeAnne Thayne’s long running Haven Point series, and that made it extremely easy to follow along. Keira comes to town from Ireland at the urging of her daughter and helps out in the kitchen at Moira and Luke’s pub. Bryan is the head chef and him and Keira immediately have a love/hate relationship (mostly hate) but I love that cliched trope in a romance, the chemistry and the sparks flying is always hugely entertaining to me! Thank you so much TLC Book Tours for having me on this tour and sending me a copy of Lilac Lane in exchange for an honest review! Finding love after loss and opening up your heart to the new and different isn't always easy. But this feel good book has you rooting for love and family from page one, with a nice dash of Irish cooking sprinkled in. While the plot wasn't especially original it was an easy story to read in just a few hours. I rate this cute book 3 out of 5 stars. From the start I Thank you so much TLC Book Tours for having me on this tour and sending me a copy of Lilac Lane in exchange for an honest review! Finding love after loss and opening up your heart to the new and different isn't always easy. But this feel good book has you rooting for love and family from page one, with a nice dash of Irish cooking sprinkled in. While the plot wasn't especially original it was an easy story to read in just a few hours. I rate this cute book 3 out of 5 stars. From the start I felt at a disadvantage in enjoying this story as much as I might have since I have not read any of the others in this series. This is actually book 14 in the Chesapeake Shores series. So for those who have read these books they may like it a bit more than I ended up liking it. We start off learning that Kiera has finally found love again after a long time and as soon as she has opened her heart up to this new love, he dies unexpectedly. To help Kiera, her daughter and father plan a way to get Kiera to come to the US from Ireland to get a fresh start. It becomes your typical story of a middle aged woman wary of love, finding herself in a new place and eventually finding love as well. It is a story I have read a million times and while it wasn't original I did enjoy many of the side characters that made this more than just a love story, they made it a family story as well. Moira was a spunky character and I really liked her relationship with her husband, Luke. I also loved Dillon and Nell. They were such an adorable older couple and Nell had me laughing a few times with her meddling ways. As for Kiera herself it was easy to see why some say she is unlikeable. She is older and set in her ways and quite stubborn. She often came off cold and rude but I was still happy that her family loved her as much as they did and that she came to find a home in Chesapeake shores and find love. I will say I wasn't a big fan of the writing style. The dialog seemed awkward and forced and didn't flow the way normal conversations flow. That and some parts of the story felt way too serious or dramatic for how small of a situation it may have been. For example, the cook-off at the end of the book. It went on for far longer than needed because of dialogs about people being worried that meddling would upset the town or Kiera or Bryan etc, etc. And it just seemed odd that they were making what was just good hearted meddling so serious. This is book 14 in Sherryl Woods’ Chesapeake Bay series. I have read and enjoyed all of the books in the series and this book can be read as a stand-alone without confusion but the entire series is so good, I think that you’ll want to start with book 1 – you won’t be disappointed. The book series is about a town in Maryland that was built by the O’Brien patriarch, Mick. Mick’s main goal in life is to have his 5 children married and in love with the person he picks out of them. Once that is accomp This is book 14 in Sherryl Woods’ Chesapeake Bay series. I have read and enjoyed all of the books in the series and this book can be read as a stand-alone without confusion but the entire series is so good, I think that you’ll want to start with book 1 – you won’t be disappointed. The book series is about a town in Maryland that was built by the O’Brien patriarch, Mick. Mick’s main goal in life is to have his 5 children married and in love with the person he picks out of them. Once that is accomplished in the first books of the series, he starts meddling in the lives of other family members and gets help in his meddling from his children and their spouses. In book 14, it’s single mom Kiera who lives in Ireland and raised her three children. Her daughter Miora lives in Chesapeake Shores with her husband Luke O’Brien. Moira feels that her mom has given up on finding happiness and asks her to come to the US to help take care of her granddaughter. Once she arrives, sparks start to fly between Kiera and the cook at the O’Brien pub. Will Moira be able to convince her mother to stay in America and take a chance on happiness or will she rturn to her solitary life in Ireland? It was great to get back to Chesapeake Shores and the O’Brien family in Lilac Lane. This is a fun series with characters that are very likeable who believe strongly in love and family. Thanks to the publisher for a copy of this book to read and review. Communication skills varied widely between the average man and woman, he’d discovered. For him and Moira, it was as if they spoke entirely different languages and, quite possibly in her case, from some universe not yet discovered. If we were all punished for our careless failure to realize how important some things are in our life until too late, we’d all be alone and miserable… It’s why we’re given second chances. It is rare for me to read a book so squeaky clean that I could recommend to my elderly mother’s rather persnickety book club, but Lilac Lane certainly qualifies for the “Church Ladies” set. It is also rare to able to enter a series at book number fourteen and be able to follow the story. While it probably would have been easier to keep track of the myriad characters if I’d had experience with the previous installments, it was not a hardship to keep them straight as brief histories were provided along the way. The plot was interesting with two distinct threads that wove together in an entertaining manner, although the story evolved ever so slowly and the genre appeared to be more women’s fiction or small-town type family drama than contemporary romance. The writing flowed well and was laced with equal measures of angst and wry humor and populated with stubborn yet endearing characters of all ages. Lilac Lane is the first book in this series that I have read. While I think it can ultimately be read as a stand alone, a new reader would benefit from reading at least Moira and Luke's story before this one. It think it might give more context for Keira's situation. I was looking forward to a good romance, but in the end it was just OK for me. The book kind of dragged and I just wasn't invested in Keira and Bryan's relationship. For me, it just lacked heat. What I did find enjoyable were the secondary characters that rounded out the story. I enjoyed watching them help Keira find a place to belong in Chesapeake Shores. I think fans of the series will enjoy this addition. Strength and determination. Stubborn pride and genuine emotions. And love, lots of love, is what the characters of Lilac Lane brought to the table in this beautiful fourteenth installment in Sherryl Woods’ beloved Chesapeake Shores series. I felt so so with this book. Part of it was due to the couple at the heart of the book, Keira and Bryan. Up to now Keira had come off as a harpy and did so at times in this one. Bryan was a bit up tight too with his reaction to Keira. It didn't help that their romance was very PG, almost non-existent. I found myself more interested in seeing Keira soften, to see her see her life in a different life, to build stronger relationships with her father and daughter. Bryan's drama was crazy and I expec I felt so so with this book. Part of it was due to the couple at the heart of the book, Keira and Bryan. Up to now Keira had come off as a harpy and did so at times in this one. Bryan was a bit up tight too with his reaction to Keira. It didn't help that their romance was very PG, almost non-existent. Bryan's drama was crazy and I expected him to get a little mad, instead of just move forward. I wanted him to rail at what he lost for so many years, but his way of dealing was probably better. I have read a dozen of books from Sherryl Woods and I checked my ratings. Apparently I love half of them (4 or 5 stars) and I hate the other half. I sensed that mixed feelings growing while reading the first part of the story. And then I got angry that all was taking so long and most of all about all this people meddling. WHY ? Can’t people mind their own businesses ? This si so rude and belittling for those they want to meddle the life in. Such a waste of my precious reading time. Chespeake shores novel has lots of romance and matchmaking going on for Kiera who came from Ireland to be with some of her family that had moved to the USA.....Lots of things going on with family and meeting a new man in her life and all the complications involved with both of their stories. It all works out in the end and romance does win over. Before beginning the actual review I need to be utterly honest with you, I was incapable of finishing this book. This was difficult for me since I always finish books I am obligated to review but apparently there is a first for everything. It’s not that I did not allow myself enough time or forgot about reading it, the truth is I was slowly being bored to death. Lilac Lane is the first book I have read by Sherryl Woods, therefore, I now know her writing is not my style. The plot was lackluster along with a group of one-dimensional characters not containing enough substance to hold my attention. I really did give it the old college try, but when bickering is the primary undertaking how much can a reader take? Although the story did embody one interesting theme it consequently lacked enough focus or time within’ the plot to make it an engaging part of the story. Consequently, if the author had fixated more on Bryan’s ordeal and reduced the squabbling an enjoyable book could have been born. Nevertheless, just since I found the book incompatible with my liking does not mean you will feel the same. Go ahead and give it a try. I like to think of books like people you're not going to like everyone you encounter. It's been awhile since I visited the O'Brien clan of Chesapeake Shores in Maryland. I was introduced to them in Sherryl Woods' delightful The Summer Garden, the 9th book in the series. (My review is here). The newest book, Lilac Lane, is the 12th in the series, and reading it is like visiting old friends. Moira O'Brien's mother Kiera has just lost her fiance to a heart attack in Ireland. Moira convinces her mother to come to Chesapeake Shores and stay with her, her husband Luke and toddler Kate. It's been awhile since I visited the O'Brien clan of Chesapeake Shores in Maryland. I was introduced to them in Sherryl Woods' delightful The Summer Garden, the 9th book in the series. (My review is here). The newest book, Lilac Lane, is the 12th in the series, and reading it is like visiting old friends. Moira O'Brien's mother Kiera has just lost her fiance to a heart attack in Ireland. Moira convinces her mother to come to Chesapeake Shores and stay with her, her husband Luke and toddler Kate. Moira agrees to visit, and Luke asks her to act as a consultant in his Irish pub, to help give customers the authentic Irish experience. Kiera is as stubborn and outspoken as her daughter Moira, and Bryan and Kiera get along like oil and water. But the matchmaking O'Brien clan (especially Nell and her son Mick, who would give Dolly Levi a run for her money) see sparks between the two and scheme to push the two together. Bryan hasn't dated much since he moved to Chesapeake Shores, he mostly keeps to himself. When Kiera moves into a small cottage next to Bryan, their relationship turns to friendship, and maybe even more. Meanwhile, Megan works hard to convince a reluctant Moira to take on more gallery showings of her photography across the country, Kiera enjoys the morning gatherings of the O'Brien women, Nell convinces Bryan and Kiera to compete against each other in an Irish stew cookoff at the Harvest Festival, and a young woman from Virginia comes to town to try and find her biological father. I truly enjoyed coming back to Chesapeake Shores, and Bryan and Kiera's budding romance between two mature adults who aren't in their 20s is a refreshing change of pace. I'm from an Irish-American family, and I laughed at the raucous O'Briens and all of their teasing and scheming and getting involved in everyone's business. If you like family stories, adult love stories and books featuring food (I'll be making Irish stew just as soon as the cooler weather gets here), Lilac Lane is a great book to add to your TBR list. There are a handful of authors that you associate with small town fiction, Sherryl Woods is one of them. This book is a return to Chesapeake Shores. It is book 14 in this series. I've read several of these. This is the perfect time to revisit this town, as the series is now a Hallmark series. Keira and Bryan are a rather unlikely couple. There romance is one that isn't real There are a handful of authors that you associate with small town fiction, Sherryl Woods is one of them. This book is a return to Chesapeake Shores. It is book 14 in this series. I've read several of these. This is the perfect time to revisit this town, as the series is now a Hallmark series. I think it plays in my favorite that I haven't read the rest of the series because it's my understanding that Keira is featured throughout and people maybe haven't loved her character. I can easily understand why you wouldn't love her, she immediately comes off as an abrupt, sometimes cold and rude, person- everything you would say were characteristics of an awful mother in law. Every book and movie that has that character, this is what Keira is. The book begins with us learning that while she F I think it plays in my favorite that I haven't read the rest of the series because it's my understanding that Keira is featured throughout and people maybe haven't loved her character. I can easily understand why you wouldn't love her, she immediately comes off as an abrupt, sometimes cold and rude, person- everything you would say were characteristics of an awful mother in law. Every book and movie that has that character, this is what Keira is. The book begins with us learning that while she FINALLY finds love (although reluctantly), he dies right away and she's left again. So her daughter and grandfather (and his new wife) decide they are going to lure Keira to the United States (from Ireland) to help Moira with her new baby, maybe help out at the pub Moira's husband runs, and (hopefully) decide that life here is better among family. The ever talented Sherryl Woods brings you another installment in her Chesapeake Shores series with Lilac Lane. The series has grown over Ms. Wood's time as a established author as now this addition making it the 14th book in the series. Her work is so endorsed that a TV series is out regarding these wonderful novels. A story of the hardships of love and life, the loss of love and the redemption that a new love can bring. Single mother, Keira Malone tried her absolute best to be best mother she could to her children. Coming from an abusive relationship, as her ex-husband left her when the children were younger, she worked hard to provide. However, working hard caused a rift with her children due to the lack of understanding on their end to acknowledge on the way of living. As the years go by, the present becomes bleak with what little light shines. After years of being closed off, Keira allows herself to fall in love. However, her fiancé dies of a heart attack and she feels anger, depressed for being alone again. Still stuck in the mundane life, she holds true by working as the manager at her ex-fiancé's bar until her feet become steady again. Just when she thinks life can't get any better, Keira is invited to come to stay with her daughter on a worker’s visa. She becomes a consultant for her son-in-law’s Irish pub and there she meets Bryan, the pub's chef. They fireworks fly with their combativeness and banter, but as they get to know each other better, things between them take off, giving Keira hope for love again. Matchmaking skills at it's finest has returned in Chesapeake Shores and this 4 STAR addition should be read by all! I really liked Keira and Bryan’s story. They both had situations in their pasts that caused them to close off to the idea of moving forward and being happy and in love with someone. But as they got to know one another, they allowed themselves to open up to the possibility of more. Light shined upon happiness and love and I love when stories have HEA! This is a multi-generational story about an extended Irish family who basically "run" the small town of Chesapeake Shores, Maryland. They are mostly entrepreneurs who designed and developed the town, and the family owns several businesses. The family's matriarch Nell is a real hoot....she's up in everyone's business and has elevated meddling to an art form. Nothing gets past Nell, and when she notices sparks flying between Keira Malone and Bryan Laramie, well let's just say they don't stand a pr This is a multi-generational story about an extended Irish family who basically "run" the small town of Chesapeake Shores, Maryland. They are mostly entrepreneurs who designed and developed the town, and the family owns several businesses. The family's matriarch Nell is a real hoot....she's up in everyone's business and has elevated meddling to an art form. Nothing gets past Nell, and when she notices sparks flying between Keira Malone and Bryan Laramie, well let's just say they don't stand a prayer. Both Keira and Bryan made poor choices in their first spouses. Keira's husband abandoned her and their three children. Keira finds love after her kids are grown only to lose her fiancé the same day he proposed. Bryan's wife left him almost twenty years ago and took their one-year-old baby with her. He's spent thousands of dollars on attorneys and private investigators trying to locate them. They seem like such an unlikely couple because both are so guarded, but when Luke hires Moira as a consultant in his Irish Pub, she gets on Bryan's very last nerve: He doesn't need nor does he want any advice from a prickly yet pretty Irish lady. This is a very sweet story about loss and how one finds the courage to be vulnerable to the possibility of love again. It's cute how the entire town of Chesapeake Shores conspires to nudge Keira and Bryan together in the guise of a Fall Festival cook-off: Their challenge is to win the most votes for the best Irish Stew in town. Plus Bryan's victory will "seal the deal" with a proposal to Keira. But what if Keira wins? Read the book to find out. If you enjoy humorous family dramas, sweet romances, and a Hallmark movie-worthy setting, then you'll love Lilac Lane. By the way, Chesapeake Shores is a Hallmark original series, so it truly is a Hallmark town! I have never read this author's books before nor have I seen the TV series, but Chesapeake Shores and Lilac Lane are places I would love to visit. The ocean breezes and the Lilac Lane is the epitome of a small-town romance, Hallmarkesque story. From this book alone, it is easy to see why the books have been made into a series on the Hallmark Channel. It has everything one would expect, from the adorable meet cute to the happy ending and all of the sugary sweet stuff that takes place in between. 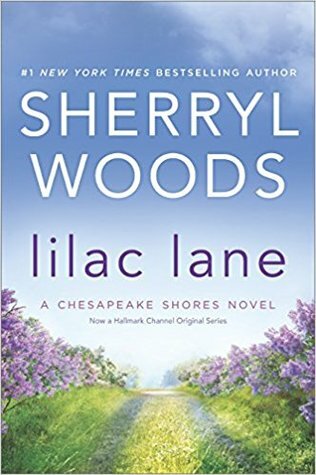 Featuring a heartwarming romance, close family ties and delightful friendships, Lilac Lane is an endearing addition to Sherryl Woods' Chesapeake Shores series. Following the sudden death of her mother Keira Malone's fiancé, Moira O'Brien is worried about her mom so she comes up with a foolproof plan to lure her to the US from Ireland. She convinces her mom that her husband Luke could use her help in his pub and she could use a helping hand with their baby. Keira readily agrees to visit temporari Featuring a heartwarming romance, close family ties and delightful friendships, Lilac Lane is an endearing addition to Sherryl Woods' Chesapeake Shores series. Following the sudden death of her mother Keira Malone's fiancé, Moira O'Brien is worried about her mom so she comes up with a foolproof plan to lure her to the US from Ireland. She convinces her mom that her husband Luke could use her help in his pub and she could use a helping hand with their baby. Keira readily agrees to visit temporarily and while waiting for her visa issues to be fully worked out, she is working at the pub as a consultant. Keira has not had an easy life and she is not one to mince words or hold back from voicing her opinions. Needless to say, she immediately gets on the pub's chef Bryan Laramie's nerves, who is not always amenable to her suggestions. Bryan is haunted by the fact that he has not seen his daughter since his wife walked out on him years ago and he has never stopped looking for her. Although he is always pleasant, he is a bit of a loner who is devoted to his job. He wants to get along with Luke's mother-in-law, but Keira always manages to irritate him with her unsolicited advice. However, when she moves in next door to him, the unlikely pair end up spending a lot of time in each other's company. After his daughter unexpectedly re-enters his life, Keira is instrumental in smoothing over the rough spots in their reunion. The relationship between Bryan and Keira is originally a little antagonistic as they bicker back and forth at the pub. Their peaceful moments are often short-lived due to their respective baggage. Their surprising friendship paves the way for their unlikely yet incredibly sweet romance but Keira's fears come between them on more than one occasion. She is quick to put obstacles in their path since she is afraid of risking her heart again. Until Bryan meets Keira, his unsettled past with his wife makes him hesitant to become seriously involved but his growing feelings for the feisty Irishwoman are the catalyst he needs to take steps to resolve these issues. What a nice easy read. It was great for me because I could pick it up and put it down and still follow the story. The characters were both new and old to this series. I very much liked it, even if the drama was more easily resolved than it would be in real life. Another visit to Chesapeake Shores, like checking in with old friends. Another installment in the O'Brien clan saga. This is Keira and Bryan's story and involves an Irish pub on the Chesapeake and a long lost daughter, as well as the usual O'Brien matchmaking and meddling. Enjoyable way to spend a few hours. It always is a treat to visit Chesapeake Shores. Every new trip there finds new friends. This was an ok story, part of the. Chesapeake shores series. Single mom Kiera raised her 3 small children by herself and has finally allowed herself to fall in love, when her fiancé dies. She agrees to move Chesapeake shores to be with her daughter and grandchild. There she finds love again. A few years back I was wandering around a used bookstore trying to find something new to read. I was having a bad day and needed to destress but nothing was appealing to me. I ended up sitting on the floor playing with my phone trying to see if I could come up with anything on Amazon I could find in the store when this elderly lady came into the aisle. She asked me if I was ok because apparently even she could sense the turmoil radiating off me. For the first time ever in my life I just began ve A few years back I was wandering around a used bookstore trying to find something new to read. I was having a bad day and needed to destress but nothing was appealing to me. I ended up sitting on the floor playing with my phone trying to see if I could come up with anything on Amazon I could find in the store when this elderly lady came into the aisle. She asked me if I was ok because apparently even she could sense the turmoil radiating off me. For the first time ever in my life I just began venting to this complete stranger about seemingly everything and before I knew it she was sitting next to me on the floor and told me when she has times in her life where everything just feels off kilter she picks up one of the Chesapeake Shore novels by Sherryl Woods. Please don’t judge me but at this time I had no idea what series she was talking about or even knew the author. I’m not a big fan of Romance novels because I assumed they all are about heaving breasts and male body parts colliding with the heaving breasts which I’m just not into reading about – I’m NOT judging anyone that is; I’m sure there are plenty of you who would roll your eyes at some of the SciFi, Mystery, Historical, ChriFi, YA etc that I think is the greatest thing since sliced bread. To each his own, let’s all just UNITE AS READERS, not divide based on genres. Anyways, as luck would have it the store had the first four in stock so I decided to buy them because I couldn’t find anything else and didn’t want to disappoint this sweet woman who took time to help a stranger. I go home to curl up with a cup of Barry’s tea and some Irish soda bread, my go to reading snack, and dig into the first book. I stayed up all night to get through all 4 then went online and bought 5-9. I’m incredibly grateful to that lady because I have been a fan of Sherryl Woods ever since faithfully picking up each new addition to the Chesapeake Shore series and others along with watching the Hallmark TV show based on that series. Woods is the perfect medicine for when life gets too stressful. Coming from an Irish family I feel drawn to the O’Briens, the way they’ve tried to hold onto the culture and passed it down to each new generation. My mom is a lot like Nell always getting involved in everyone’s life much to our annoyance and love. Woods has continued that trademark warmth, love and sense of family with Lilac Lane. Since having reading the previous 13 I was extremely excited to get to return to Chesapeake Shores with book 14 and see how she was going to continue her matchmaking skills. The fun thing about her books is it’s normally pretty obvious in Chapter 1 or early on who is going to get set up with who but what you don’t know are the challenges they are going to face, how will they get together, who is going to break first, and most importantly how is the family going to help; after all these books are really about the love, loyalty and comfort of knowing family is there for you in all shapes and forms. Woods does not disappoint with Lilac Lane as you get to feel once again like you are walking along the streets, into O’Briens Pub for a pint, Sally’s for a chocolate croissant or Megan’s Art Gallery to check out Moira’s latest work. My only complaint was I was really hoping she was going to include the 2 recipes for Shepard’s Pie her characters were fighting over as I was vastly curious what her take on them would be and how’d they differ. Any time I try a new ‘Irish’ restaurant in the States I ALWAYS order the Shepard’s Pie because I feel like you can test their true authenticity based on that one dish alone. Although nothing beats the recipe that has been in my family for some time and which I now have a craving to make! If you want to fall in love with the characters and setting in a book and be treated to an escape without having to leave the comfort of your favourite chair, this is the book to do it. I loved the characters right away and found myself engrossed in this story before I was even finished with the first chapter. Keira is the kind of character that will make you nod your head in agreement as you relate to what she's going through. I loved learning more about her and her family. One of the things th If you want to fall in love with the characters and setting in a book and be treated to an escape without having to leave the comfort of your favourite chair, this is the book to do it. One of the things that impressed me about this book was how full of important characters it was. Everyone had a purpose and everyone was lovable in their own way. The story of Bryan captured my heart and kept me excited to see what was going to happen next. This novel is also filled with delicious sounding food--I dare you to read it and not walk away hungry for some Irish Stew and soda bread. This book made me laugh and cry in all the right places. If you are looking for a romance with some substance and a lot of reasons to read it, may I recommend this one. Lilac Lane is a wonderfully rich, atmospheric novel you are sure to enjoy. I know I did. Lilac Lane was a great book and entertaining as well as a love story. Kiera Malone lives in Dublin along with her two sons, but her daughter, Moira and her father Dillon O'Malley lives in Chesapeake Shores. Moira wants her mother to come and live in the U.S. and meet her granddaughter. Kiera comes with the intent of staying for six months and going back home, as long as there was a job for her to do during that time. She works in her son-in-law's pub, O'Briens, as a consultant, but has confronta Lilac Lane was a great book and entertaining as well as a love story. Kiera Malone lives in Dublin along with her two sons, but her daughter, Moira and her father Dillon O'Malley lives in Chesapeake Shores. Moira wants her mother to come and live in the U.S. and meet her granddaughter. Kiera comes with the intent of staying for six months and going back home, as long as there was a job for her to do during that time. She works in her son-in-law's pub, O'Briens, as a consultant, but has confrontations with the chef, Bryan Laramie. He is a mysterious person that keeps to himself, but when Kiera moves next door and tries to be neighborly, they start spending more time with each other, but not at work. Well you know what can happen, but Bryan's past catches up to him and does the town try to make Kiera and Bryan see what they see. It is a great story and if you want to know what happens, buy the book. It is a great story. Thank you for giving me the priviledge to read Lilac Lane. Chesapeake Shores sounds like an absolutely magical little town, at least if you don’t mind a whole town full of nosy and interfering neighbors. Not that the collective O’Brien clan doesn’t mean terribly well, and not that they don’t seem to generally do well in their meddling, but Keira Malone is used to being the boss of her own life, thankyouverymuch. Which doesn’t mean that her life doesn’t get a much needed makeover when she arrives from Dublin to visit her father, her daughter, and her new grandbaby. The ostensible reason for her visit is to help take care of her new (and only) grandchild, and to “consult” for her son-in-law about the authentic “Irishness” of the traditional Irish pub he’s opened in Chesapeake Shores. Keira has spent her entire adult life working in and managing Irish pubs in Ireland, so she certainly has the right experience for the job. But it’s a made-up job. Her daughter and her father, both now living in Chesapeake Shores, fear that Keira will turn in on herself after the death of her fiance. After all, that’s exactly what Keira did after the breakup of her marriage. She turned inward and pretty much stayed inward – and exhausted, raising three children on her own with zero help from her drunken ex-husband. And just when she finally let herself open up – boom, another disaster. So the family, not just Keira’s daughter Moira and Keira’s father Dillon, but the entire O’Brien clan that they have both married into, plots and schemes to get Keira to Chesapeake Shores. And once she’s there, and they all observe the sparks that fly between Keira and the pub’s resident chef Bryan Laramie, they all keep right on scheming, with an eye towards matchmaking between the chef and the “consultant” who seems to question his every move. Or at least he feels that way. Bryan is just as alone as Keira, and the whole town seems to be more than willing to conspire to get these two together – from manipulating Keira into renting the cottage next door to Bryan’s house to cooking up a cooking contest to finish off the local Fall Festival – a cooking contest that pits Keira’s authentic Irish Stew recipe against Bryan’s hand-me-down version. The winner of their contest will take all, not just the prize, but also the other’s heart. If they can both figure out what it really, truly means to “win”. Escape Rating B+: Lilac Lane is a sweet and savory mix of contemporary romance, women’s fiction and small town magic. Not magic as in Harry Potter, but just the magic that seems to permeate so many small town romances. Chesapeake Shores is just a lovely little town where good things happen to good people – and where there don’t seem to be any bad people – if maybe a few misguided ones – who do not appear in this story. Chesapeake Shores is just a great place to live. Keira Malone and Bryan Laramie are an interesting and slightly different protagonists for a romance. Both are a bit older – while it’s not specified precisely, both have adult children and seem to be on either side of 50 – with Keira a few years older than Bryan. They are both people who have been seriously wounded by life and love, and in ways that are similar underneath some rather startling surface similarities. Keira left her husband because he was an alcoholic, Bryan’s wife left him because he was ambitious, self-absorbed and absent. But Keira kept in touch with her ex – not directly, but enough that he could have visited his children anytime he wished – if he wished. Bryan’s wife, on the other hand, just disappeared with their daughter. She vanished. He’s spent years, and countless thousands of dollars, trying to locate them both. It’s not that he wants the marriage back – and who would, but he wants to regain contact with the daughter he still loves. Neither of them is good at letting people in. Keira because her two attempts at romance have ended in disaster, and Bryan because he’s never bothered to divorce his missing ex. Both of them need resolution in their lives – and there’s something about the way that they spark each other that makes them both reach for it. The romance is of the squeaky-clean variety (the hero and heroine have only a few kisses between them when he proposes) but it works for this story and setting. Both Keira and Bryan are tentative about love, and that hesitation is expressed wee in their non-courtship, two-steps-forward-one-step-back relationship. Although, speaking of two-steps-forward-one-step-back relationships, Keira’s relationship with her daughter Moira, and Moira’s relationship with her husband in specific and with the universe in general feels just a bit “off”. As a reader, I couldn’t figure out why Moira acted the way she did, and in real life I’d feel more than a bit sorry for her husband and her mentor. Chesapeake Shores does seem like an absolutely marvelous place. The large O’Brien clan is deeply interwoven into the fabric of the town, which seems to have been created by one of them as a tourist destination – and it has flourished. O’Briens seem to be everywhere. Keira’s father has remarried into the family, as has her daughter. The other women of the O’Brien family both meddle in Keira’s life with abandon and become the circle of sisterhood that she never had – and dearly appreciates now. Lilac Lane is the 14th book in the Chesapeake Shores series. I’ve not read the earlier books, but was able to get into the story easily. Enough of the family’s previous connections and romances were explained in a way that meant I didn’t feel left out. It probably helped that Keira herself comes in as an outsider, so things have to be explained a bit to her – and we get the benefit of that.